From the Assembly Plant, June 15, 2004. GM is pleased to invite a LIMITED number of Corvette Enthusiasts to a Private Tour of the GM Exhibit at the Los Angeles Auto Show. Pre Registration is required and participation is limited. The Corvette Corral will be located at the Los Angeles Convention Center, South Hall with entry from Pico Drive. You MUST have a Corvette Corral Pass in order to enter the Corvette Corral. Upon entering the Corvette Corral you will pay $10 to the Parking Attendant. Entry into the Los Angeles Auto Show will be $6 to be paid inside the Corvette Corral. Cars will be parked in the Corvette Corral from 8 AM until 8:30 AM. There will be no admittance to the Corvette Corral after 8:40 AM. We will walk from the Corvette Corral at 8:45 AM to a special entrance into the GM Exhibit. In order to receive your Corvette Corral Pass and be placed on the Registration List, please send a Self Addressed Stamped Envelope (SASE) to Janet Curran Post Office Box 550 Yucaipa, CA 92399 Include with your SASE a note containing the License Plate number of your Corvette, your first and last name, the first and last name of anyone that will be with you and an email address where we can reach you. If your name is not on the Registration List, you will not be permitted to enter the Private Tour of the GM Exhibit at the Los Angeles Auto Show. Deadline for Registration is January 3, 2005. C6 Z06 West Coast Unveiling Change! pass on the Unveiling details. The West Coast unveiling of the C6 Z06 is "tentatively" set for January 11, 2005. We are working on a Corvette Corral and maybe another perk or two. We will be limited to the number of participants, so this will be on a first come, first serve basis. Pre-registration will be required. More details will be posted as they are finalized. Mark your calendars. Dan and Jake headed back to Florida after the C5 Registry dinner at Road Atlanta last evening because of the approaching hurricane. Jake reports Dave and Karen Hill, Dave and Glenda Dave McLellan, John Cafaro and son, attended the dinner, all spoke at the dinner hosted in the BBS wheel room. The Corvette Coral, sponsored by IMSA, The National Corvette Museum, and the C6-C6 Registry was great! Dave Hill's team brought several C6's to the event. Four were convertibles, and one had the new power top. Members present were treated to an demonstration of the ease of use and the flawless operation of the new power top. DETROIT - General Motors Corp. today announced its latest marketing program, "The GM 72-Hour Sale," which runs from Sept. 28-30, 2004. Qualified buyers are able to finance a new GM vehicle through GMAC for 72 months at 0 percent interest. All 2004 Buick, Chevrolet, GMC, Pontiac and Oldsmobile cars and light duty trucks are included in this program. "A great deal like this doesn't come around very often," said John Smith, group vice president, GM North America Vehicle Sales, Service and Marketing. "We think consumers will respond very favorably to this offer, but they need to act quickly as the program lasts only three days. GM offers the most wide-reaching portfolio of vehicles, including high performance vehicles like the Chevrolet Corvette and the Pontiac GTO and the broadest lineup of SUVs in the business - ranging from the Chevy TrailBlazer to the GMC Yukon Denali. We also offer more segment-leading fuel efficient vehicles than any other manufacturer. Combine all this with interest-free financing for up to 72 months, and consumers will find truly great values during GM's 72-Hour Sale." "The GM 72-Hour Sale" will be supported by a national advertising campaign scheduled to run from Sept. 23-30. It will include network television, newspapers, radio, interactive and extensive dealer promotions. A new class of gasoline, called Top Tier Detergent Gasoline, will be appearing at retail stations of some fuel marketers. This gasoline meets detergency standards developed by four automotive companies. A description of the concept and benefits of Top Tier is provided in the following question and answer section. Top Tier Detergent Gasoline is a new class of gasoline with enhanced detergency. It meets new, voluntary deposit control standards developed by four automotive companies that exceed the detergent requirements imposed by the EPA. Top Tier Detergent Gasoline standards were developed by four automotive companies: BMW, General Motors, Honda and Toyota. Why was Top Tier Detergent Gasoline developed? Top Tier Detergent Gasoline was developed to increase the level of detergent additive in gasoline. The EPA requires that all gasoline sold in the U.S. contain a detergent additive. However, the requirement is minimal and in many cases, is not sufficient to keep engines clean. In order to meet Top Tier Detergent Gasoline standards, a higher level of detergent is needed than what is required by the EPA. Also, Top Tier was developed to give fuel marketers the opportunity to differentiate their product. Why did the four automotive companies join together to develop Top Tier? All four corporations recognized the benefits to both the vehicle and the consumer. Also, joining together emphasized that low detergency is an issue of concern to several automotive companies. Top Tier Detergent Gasoline will help keep engines cleaner than gasoline containing the "Lowest Additive Concentration" set by the EPA. Clean engines help provide optimal fuel economy and performance and reduced emissions. Also, use of Top Tier Detergent Gasoline will help reduce deposit related concerns. Who should use Top Tier Detergent Gasoline? All vehicles will benefit from using Top Tier Detergent Gasoline over gasoline containing the "Lowest Additive Concentration" set by the EPA. Those vehicles that have experienced deposit related concerns may especially benefit from use of Top Tier Detergent Gasoline. Where can Top Tier Detergent Gasoline be purchased? The Top Tier program began on May 3, 2004. Some fuel marketers have already joined and are making plans to introduce Top Tier Detergent Gasoline. This is a voluntary program and not all fuel marketers will offer this product. Once fuel marketers make public announcements, a list of all fuel marketers meeting Top Tier standards will be made available. For now, look for the "Top Tier" designation at the gas pump near you. C5/C6 Registry Members - Our deepest apologies! Due to the amount of damage Hurricane Frances did to our area of the state of Florida, Dan and Jake, who are insurance agents on the east coast of Florida, will NOT be able to attend the MidAmerica FunFest in Effingham, IL this weekend. Members, please don't change your plans! This is a great event for ALL Corvette enthusiasts. If you were planning to attend, please do so and support one of our Corporate Members! As Most of you know Jake Drennon and myself are both State Farm Insurance agents in Florida. My office is in Merritt Island which is the southern half of the Kennedy Space Center and my house is on Cocoa Beach. Both place were on the North side of the storm and were hit by the Eye Wall as Frances came ashore. Jake's home is on Merritt Island and his office is in Titusville which is 20 miles north of Merritt Island. At this point we have had moderate damage and have no electricity in our offices, but both Jake and I, and our families are OK which is the most important thing. Both our homes are still habitable, but with moderate damage, and as of today, finally, electricity. We are also setting up generators at our offices to handle the expected flood of claims. We have not internet services or phones at any of our locations at this time. Marginal cell phone service is our means or communication. We ask that the members bare with us during this time since most of our waking hours will be spent taking care of our insured's and we will not have a lot of time for Registry business. Please keep emails to the C5 Registry office to a minimum as not to stack up in the incoming mail, the Registry office has no power yet, no internet service, and marginal phone service. Kathy will be in the office at times but she also has damage to her home, and again, phone service at the office is iffy. We hope to be back to normal in 30 days but I will keep you all informed. "The LS7 OHV V-8 for 2006 Chevrolet Corvette ZO6 is the first engine confirmed for the Performance Build Center, but others will follow." is pretty clear. However, this GM released photho of a workman in the center shows a pretty good view of and engine being built there ...... umm....... wonder what this is?????? C5/C6 Registry Members - Our deepest apologies! Due to the approach of Hurricane Frances to the state of Florida, Dan and Jake, who are insurance agents on the east coast of Florida, have been called back by their company and will NOT be able to attend the 10th Anniversary NCM Labor Day Event this weekend. Members, please don't change your plans! This 10th Anniversary of the NCM is a very special time for ALL Corvette enthusiasts. If you were planning to attend, please do so and support the greatest museum for the greatest performance icon on earth! We ask that you keep everyone in the path of this powerful hurricane in your prayers. On Thursday, August 19, 2004 after the normal start of the DOSP weekly cycle, it became necessary to place option (C2L) Roof Package on full stop for the VET (Corvette) Allocation Group. In that regard, a constraint was entered in the system that will stop the processing of any orders that contain (C2L) Roof Package in this week's DOSP Cycle. We anticipate this constraint will last for several weeks at the very least. Due to the late implementation of the (C2L) Roof Package constraint, GM will protect all Dealers' VET Allocation for! this week's DOSP cycle. Any dealer who does not enter a buildable order will have a VET pattern order placed for them and available to view in the "Placed" tab of VOM Order Management on Tuesday, August 24, 2004. Dealers should review placed VET orders at that time and make any required changes within the current posted constraints. While this constraint is in place, dealers may still order the (CC3) Transparent Roof Panel. If CC3 is not specified, the vehicle will be shipped with the standard painted roof panel. For customers who wish to have both roofs, we do anticipate having the transparent roof available through GMSPO in the future. Please suggest these customers order the vehicle with the painted roof panel, and then purchase the transparent roof panel through GMSPO at a later date. BOWLING GREEN, KY – YES, IT’S TRUE! Today is the day that will go down in history… as tractor trailer loads of C6s were released from the Bowling Green assembly plant to be dispersed amongst all the children of the world! Of course, they must first go to your dealer to be bathed and beautified before you are allowed to experience “that C6 feeling”! Members, they are coming. The latest word it that they are not necessarily being shipped by those that were built first, but are going out in groups that so that they can be dropped off at dealerships in a delivery pattern. Those cities closest to Bowling Green certainly can have a C6 by tomorrow morning. If your dealer told you that yours was built, you possibly could have it by this weekend. Start calling your C6 dealership! C5/C6 Net Member "Rand from Ohio" has taken the time to distill links to the new commericals, for the C6 located on the Chevrolet web site: Caution, Long load times but way kool ! The C6 features Keyless Access and Push Button Start. You can keep the Keyless Access Transmitter in a pocket or purse and operate the doors, trunk and ignition. • To open the doors you do not need to press the unlock button on the Keyless Access Transmitter, simply touch the pad located at the edge of each door and the doors unlock and open if the transmitter is within three feet of the door. • To Start the Engine depress the brake pedal on an automatic transmission or the clutch pedal on a manual transmission car. Then press the top of the start button located on the instrument panel to the right of the steering wheel. The engine will start if the Keyless Access Transmitter is in the car. • To Stop the Engine shift to Park on an automatic or Reverse on a manual and press the Off/ACC button (the bottom part of the Start button). The electrical system will not shut off unless the car is in Park or Reverse, which could run the battery down. The Corvette comes with Goodyear Extended Mobility Tires that eliminate the need for a spare tire. Even when the tire loses pressure you can drive up to 100 miles at 55 mph. When a tire is under inflated, a warning light will come on and alert the driver to check the tire pressure. Press the Reset button and then press the Gauge Information button to display which tire has low pressure. The Head-Up Display projects instrument panel information on the windshield, so you can keep your eyes on the road. The HUD displays the speedometer, turn signal indicators, high-beam headlight indicator, tachometer, oil and temperature gauges, performance shift light, check gauges warning light and G-force gauge. The controls to move the HUD higher or lower on the windshield or brighter or dimmer are located on the instrument panel to the left of the steering wheel. This system limits wheel spin and helps maintain directional control during most driving conditions. The Active Handling message is displayed in the Driver Information Center when the system is turned on. To turn the Traction Control off, press the Active Handling Button located on the console once. Press it twice to turn on the Competition Mode. Press and hold it to turn off the Active Handling and Traction Control Systems. The Magnetic Selective Ride Control provides benefits such as: reduced impact harshness, improved road isolation, improved high-speed stability, improved handling response and better control of body ride motions. The control knob is located on the center console. You can select a setting at any time. Select Tour mode for normal city and highway driving for a smooth, comfortable ride. Select Sport mode where road conditions or personal preference demand more control. This setting has more feel, or response to the road conditions. You are at 21 percent throttle or less. When the light comes on, you can only shift from first to fourth. After shifting to fourth, you may downshift to a lower gear if you prefer. Final orders for the discontinued Precision Red (27U) must be entered by Saturday, August 21st. Precision Red will be constrained as it is phased out. As a result, any Precision Red orders not selected for production by the end of business on Tuesday, August 24th, will need to be changed to another color before that order can be scheduled for production. There will be an Open House with Plant Tours on August 4, 2004. Astronauts & Corvettes they got together, download this cool PDF Graphic celebrating the 35th Anniversary of the Moon Landing! It's Here 2005 C6 CORVETTE PRICING! CLICK HERE for the pricing and order guide! It's Official! The new C6 Red replacing Precision Red, and a closer match to Torch Red, will be called Victory Red. Ummm ... So let's see, if you got one of the few Precision Red C6's, how long before it's a collector car? DETROIT, MICHIGAN – The sixth generation C6 Corvette can turn heads by simply standing still. Add to that an all-new generation of accessories, designed and engineered by the same people that created the vehicle, and the result is a Corvette enthusiast’s dream. While designing the C6 expressive new muscular design GM took it one step further and integrated accessories into the vehicle development. Corvette Chief Engineer and Vehicle Line Executive, David Hill, worked with the accessories team at the onset of the Corvette design process. “All Genuine Corvette Accessories are engineered to meet strict OEM quality standards,” said Hill. “The result is an array of accessories with the best fit, best function and most tailored appearance for the Corvette.” GM’s design studio created a genuine Corvette accessory logo that will be featured on many of the new accessories. It’s all about personalization. The Corvette owner can customize the appearance of their vehicle by alternating the standard ebony pieces for body color trim pieces. Body color accessories, including interior trim, a center high mounted stop lamp, license plate holders and exterior door handles, offer C6 owners an extra dose of vehicle personalization. There are also color keyed interior options for the shift knob and boot, and park brake handle and boot. A 10-spoke wheel will be offered in multiple finishes and aluminum sill plates coordinate with the standard metal interior accents. “Such high-level integration with the vehicle ensures harmony between the vehicle and the accessories,” said Vicki DeGrace, Corvette Accessory Program Manager. 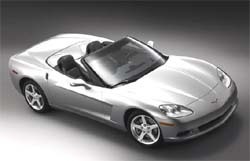 “Genuine Corvette Accessories were designed to enhance the appearance and meet customer needs. To increase storage space, GM has designed a storage tray for the Coupe and a storage pouch that works in both the Coupe and Convertible. A wind break reduces air turbulence when the Corvette is in top-down cruising mode. For a complete list of Chevy Accessories and to find out about more ways to personalize the Corvette C6, please visit www.chevyaccessories.com or call toll-free 866-901-9001 to speak to one of GM’s knowledgeable accessory agents. All Chevrolet accessories can be purchased through Chevrolet dealerships. Torch Red…or something like it…the saga continues! Registry Members – The saga really does continue. The latest word is that the powers to be are REALLY Listening and are taking ACTION! Thanks for all the emails we have received expressing interest in “It’s about time RED”. Your submission of names has been overwhelming and we certainly must say that our members are the most creative Corvette owners we’ve ever met! Here’s the latest plan…it is to only offer Precision Red for a period of time at the start of C6 production. (There’s no word on what “a period of time” is, so your guess is as good as ours. We believe that it would happen by mid September 2004.) Then Precision Red will be ELIMINATED and this "NEW RED" will take its place. So if you are ordering (which everyone who wants a C6 is) then you would have to have your dealer hold off on your Precision Red order until the "NEW RED" is released into the dealer ordering system. Once again, this “NEW RED” is not going to be exactly like the C5 Torch Red we all know and love. We do know it is going to be a new VERSION of RED for the C6. The latest guess (and that’s all it is) is that this red is similar to the red that is on the SSR Chevy truck which is currently called "REDLINE RED". But I promise you they will not use that name. Redline Red is a brighter truer colored red. It does not have the C5 Torch Red orange hue color in it. For all our members who have been asking about a Torch Red type replacement interior to be used in the C6 lineup, we have heard of NO plan for that color of interior for the 2005 C6 model year. But things can always change! Registry Members – Scott Montgomery, sales manager for Les Stanford Chevrolet in Dearborn, MI has informed us that the first batch of C6 allocations will be accepted by GM today! We’re sure that many of you have been standing in line at your dealer’s to place your order your brand new C6 or have left large deposits with them. Today is the day to call your dealer and ask, “when will MY order be submitted?? ?” We know that all 7,500+ of you will keep the phone lines busy to your dealers today! Thanks, Scott, for this valuable info! Registry Members - FINALLY the powers to be at C6 are listening. All during the Birthday Bash, especially at the seminars, it became very evident from our members that a C6 without TORCH RED was not what the members envisioned. Our members wanted something similar to Torch Red to be offered in the C6 color palette. We have learned that our concern about no Torch Red was taken seriously by GM management and effective sometime after start of production the additional “NEW VERSION” of C6 Torch Red (which we are very sure will have a new name) will be offered to Corvette owners when they order their new C6. Let’s have some fun with this and submit names that we think GM should call this new red. We will gather all the emails and forward them to our friends at GM. At the Registry Office our personal favorite so far is “it’s about time RED”! So if you would like to submit a name for this new C6 red which will be unveiled after the start of production, we will pass it on. This should be some GREAT C6 FUN !!! So, let's help them give this new color a name! Send your suggestions, for a name, Click on this link, include your Name, Member Number, and what you think the color should be named. Be sure and do this before June 18, 2004 ! The last C5 convertible was scheduled to come off-line on Monday, the build of the very last C5 is just weeks away. The final one of the popular fifth generation Corvettes is currently slated for build the week of June 28th. GM made a terrific showing in the just-released Strategic Vision 2004 Total Quality Index (TQI), providing further evidence that GM is making significant strides in its quest for quality leadership in the automotive industry. Among GM's 11 of 19 segment winners were the Corvette and XLR. Chevrolet ledin five segments, Cadillac topped three segments (and had the highest scoring model - the Cadillac XLR), Saturn had two wins and Buick had one. TQI measures new vehicle owner satisfaction by assessing buyers' responses to the complete ownership experience, including buying, owning and driving. Corvette was No 1 in the Sports Cars Over $25,000 category. The Cadillac XLR was tops for Convertibles over $30,000. Registry Members – All aspects of the Corvette chassis have been improved over ALL the previous Corvette generations. The word is that NOTHING was compromised relative to past generations. As I’m sure you’ve heard, with the exception of some nuts and bolts, all significant chassis parts are new for the C6. Every part of this new generation of Corvette contributes to the total package of the C6. As an example, the Goodyear run flat tires are larger (they refer to this generation of run flats as the third design) which are substantially quieter than previous EMTs. You will notice fewer bumps into the C6 cabin, even with the EMTs newly designed lower aspect ratio. At the Birthday Bash everyone talked about the improved cornering and the feel that the C6 was having no problem in getting the increased horse power (400 HP and 400 lbs Torque) to the ground. (How members seem to find this out while JUST RIDING in a C6 is not clear!) We were told the improved ride is directly related to the front suspension travel being increased 13mm. In technical terms that’s 9mm in rebound and 4mm in jounce. They also shared with us that the rear has a full 20mm increase, all in jounce. What does this mean…more travel allows the shocks to dissipate the wheels energy with less disturbance to the body. To the driver the feel of the steering will be more of a precise on-center touch with improved straight line tracking and less wheel kick from road disturbances. This allows for overall improved handling because the steering castor angle was increased from 7 to 8 degrees for high speed stability and reduced “trough wandering” coordinated with increased stabilizer bar sizes for less roll in the corners which we all know improves responsiveness and maneuverability. If you're planning a holiday trip to Bowling Green, you should be advised, for the first time the Bowling Green assembly plant will have a four day Memorial Day weekend. The plant will shut down both Friday, May 28, Saturday May 29, Sunday May 30, and Monday, May 31. Normal operations will begin Tuesday, June 2nd. Registry Members – The new 2005 C6 takes safety very seriously. Seat belt pretensioners with improved buckle access. Hidden seam side impact air bags within the seats. Passenger air bag hidden seam design within the instrument panel. Manual PSIR on/off switch for passenger air bag. Pass Key III vehicle immobilizer system. Keyless entry system with panic alarm. Entrapment release handle within Convertible trunk. Optional OnStar available with automatic crash notification. Enhanced seat belt warning for driver. Dual level front air bag. Daytime running lights/fog lamps/side turn signal repeater. ABS along with traction control. Run flat tires with tire pressure sensors. A special C5-C6 Registry thank you to Rick Daniel of Les Stanford Chevrolet or making the preliminary ordering workbook available to our members! Thanks to Rick, you can download the workbook with all the options, RPO Codes, Interior and Exterior colors and more.. The real thing folks, not just another internet rumor! CLICK HERE , to visit Rick's web site and download the workbook. Registry Members – Thanks for all your emails requesting detailed details about some of the finer points of the new C6. Today’ school will be on stabilizer bar comparisons between the C5 and the new C6. The C6 will have remarkably improved handling. For example, the steering caster angle increased from 7 to 8 degrees for high-speed stability and reduced "trough wander". This leads to a noticeable improvement in responsiveness and maneuverability with less cornering roll. As you can see, the stabilizer bars above make a difference. Registry Members – The automatic HVAC system which is now (easier to operate) standard on all C6s has been improved with a liquid crystal display. It will be a much easier to operate dual-zone system than in the past. The cabin air will have a new filtration and odor control system along with a thermal expansion valve that will improve AC performance. The new dash outlet vents are more accessible and have chrome accents. They also can be individually shut off. The new outlets allow for a much improved airflow distribution for both instrument panel and heater ducts with reduced blower noise. Registry Members – Internationally acclaimed fog lamps were chosen for the C6. The stylish design chosen is a halogen parabolic reflector lamp within a black housing. Of course the most stylish look of a C6 will be the one your competition (and we know there isn’t much) will see from behind as your C6 “Exceeds their Expectations”! You will be smiling knowing that they’re looking at what Corvette calls the “classic round tail lamp look”. It is a complex multi-faceted reflector with 301 facets per lens. This design eliminates all exposed fasteners. The Low mounted back-up lamps were designed for mounting on a surface which would be less disruptive. Therefore they are mounted very low on each side of the rear bumper fascia. The smooth reflector lens optics are protected by a neutral density lens. Registry Members – The C6 will have HID Xenon-Arc high density lamp low beam and halogen high beam projector system. The four-bulb system operates concurrently with the low and high beams within a stainless steel chrome plated bezel. This has the affect of putting out 80% more light than the C5’s lighting system currently does. Of course this allows for greater visibility of signs and road markings because of the improved light spectrum output. Registry Members – Both roof configurations for the C6 (painted and transparent) will have a Textured Powder Coating for their frame and hardware components. These will be considerably more scratch and mar resistant. The painted panel will have the latest technology regarding its finished paint coat look. Both tops are larger by 15% over the C5 and yet are 8% lighter than the C5’s current removable roof panel. This weight savings is primarily achieved through the use of computer analysis, highest quality materials, and magnesium processing for improved design. Registry Members – Sebring…what a great venue for Corvette and its C5-R Racing Program, as well as visiting one-on-one with Corvette’s Brand and Marketing Team. A friend of the Registry, Corvette Marketing Director, Rick Baldick shared with us the current plan for launching the C6 in late July (after the plant’s two-week summer vacation break). The start up will be with the C6 Coupe ONLY being produced for possibly six to ten weeks to allow the production cycle to ramp up. After the Coupe’s production is proceeding smoothly, then the C6 Convertibles will be brought on line slowly…tentatively scheduled for mid to late October 2004. Because of the slow start up associated with any new model, it appears that the 2005 model year run will produce approximately 4,000 fewer Corvettes than in previous years. But this we can promise, under Plant Manager Wil Cooksey’s leadership C6s will be CORRECT from the beginning!!! Please join Jake and I in praying for Chip and his family. "Due to budget cutbacks, we will have the corral area and will have a limited amount of water and soda. There will be no food this year. The corral will be a combination of Cadillac and Corvette on Friday and the Corvette only on Saturday. The corral will open at 7:30 on Saturday. It has been moved to turn 1 (one)." Quieter C6 Coupe or Convertible !!! Registry Members – Several noise improvements came about due to the XLR Cadillac program. A four-point powertrain mounting system (first used on XLR) significantly reduces vibration. A full-length tunnel insulator reduces both road and engine noise. Numerous seals, baffles and sound absorbers have been added, as well as a bulkhead for the convertible to improve storage space behind the seats. Registry Members – Our Corporate Member Dealers have passed along this C6 marketing information, which they received. It appears that Corvette is fortunate to have the most dedicated and enthusiastic customers in the world. The loyalty rate for Corvette is 77% !! Its customer awareness percentage of 94% is the highest level of any automotive nameplate. I wonder how much they spent in finding this out? All they had to do was ask any of our members! It is reported that on any given weekend (with over 270 Corvette Clubs registered around the country) you could find a Corvette Club meeting, show, race or sales event to go to and discuss Corvettes. It is estimated that there are 95,000 Corvette Club members (7,400+ of them are C5 Registry members!) around the world. Finally a C6 Battery that will Last !!! Registry Members – If the C6 doesn’t do anything else for Corvette owners, it will finally provide a battery that will actually last. Our 006 Agent has just risked his very soul in getting us the most recent test results regarding battery stand times from the "battery test central command". Drum roll please…the new C6 flooded battery for 2005 should last in an unused mode 52 DAYS! As opposed to the wonderful C5 AGM battery (99-03) which could survive only 25 DAYS! At least the 2004 final year C5s received a special newly designed flooded battery that was good for 41 DAYS. Halleluiah!!!!! C6s Manual 6-Speed is going to be Fabulous! Registry Members – The information continues about the fabulous improvements to the C6 manual transmission. This gets a little technical, so please read closely. The shorter lever (fore/aft reduction by 26mm and a vertical reduction of 14.5mm over the current C5) really improves the feel along with a stepped tooth synchronizer (which reduces gear clash). The ball/spring detent is now made with a roller detent as well as the linear bearing to the top shift rail (this all is an effort reducer). The synchronizer sleeve width increased to allow for the shorter throw. Newly designed shift knob improves operation in a number of positions (joy stick or palm). All manual C6s will have a shift to reverse for vehicle shut down by way of a dedicated reverse engagement electrical switch. The Z51 optioned 6-Speed manual will have its own special set of gear ratios. They are as follows: 1st gear 2.97:1, 2nd gear 2.07:1, 3rd gear 1.43:1, 4th gear 1.00:1, 5th gear 0.71:1, and 6th gear 0.57. This will allow for aggressive peddle to the metal with no loss in top speed. Now for the really big news…a manual transmission integral cooler pump is part of the Z51 package. This of course is for high-speed heat reduction. This pump will be driven by the countershaft pushing transmission fluid through a heat exchanger inside the radiator end tank. You will be able to monitor the temperature because of a lubrication temperature sensor that will be included with Z51 C6s. CLEVELAND, OHIO - The 2005 Chevrolet Corvette convertible, a member of the sixth generation of an American performance car legacy, will be unveiled March 2, 2004 at the Greater Cleveland International Auto Show by Brent Dewar, head of the Chevrolet division of General Motors. Brent Dewar will pull the cover off to reveal a completely new Corvette convertible. The Corvette convertible along with the recently introduced coupe will deliver more power, passion and precision than any previous model and will set a new standard for performance car excellence. Following the unveiling, Tadge Juechter, assistant chief engineer for the Corvette launch team, will do a vehicle walk-around pointing out the key features of the exterior and interior, as well as the powerhouse under the hood. Members of the Cleveland area Chevrolet dealer body and Chevrolet Corvette enthusiasts clubs will also be present to view the unveiling. The event will take place at the Chevrolet exhibit at the 2004 Greater Cleveland Auto Show. All members of the media are invited to attend. Registry Members – C6’s Convertible Power Top is reported to cycle down and up in 18 seconds. So you have to ask yourself… Just how many raindrops can fall in my interior in 9 seconds? Visibility in the rear on a C6 Convertible has improved by 18.5%. The power top will be a one button does all operation. Current rumor is that the power top option will cost between $1,500 and $1,600 over a manual-operating top. The 2nd Manufacturing Validation Build (MVB) for the C6 began February 20th. The goal of this build is to test the assembly tooling and processes for this new car. For each bucket of cars built, the plant should see improvement in parts and tooling. The first car came off the end of assembly February 20th. A total of 20 units will be built in this bucket during the next few weeks. Registry Members – Mesa, AZ – The information just keeps coming! Our "006 Agent" has been busy! His preliminary report of a C6 Coupe with 6-speed completed a 0-60 run in 4.2 seconds with Z51 and a base Coupe completed 0-60 in 4.3 seconds. Quarter mile times are reported at 12.6 @ 114 mph with a lot more testing to go. These numbers could conceivably improve. The way we see it, the numbers above are better than the ZR-1’s acceleration was and almost equals a 2004 Z06. Registry Members – Mesa, AZ – Just in, the C6 has been undergoing continuous durability and speed testing. Our "006 Agent" on the spot reports that a 2005 C6 Coupe with 6-speed manual transmission and Z51 performance handling package reached 186 MPH or 300 KPH! It has long been rumored that Corvette’s European Division wanted a 300 KPH Corvette to enhance their marketing effort. We’ve been on the Autobahn and they’re right!! Unfortunately for us here in the US, we’ll just have to save this ability of 186 MPH for the Nevada Silver State Classic Challenge, May 13-16, 2004 or September 16-19, 2004 www.silverstateclassic.com/ , or for those of you closer to Nebraska, don’t miss the Sand Hills Open Road Challenge, August 5-7, 2004 www.sorcrace.com/ . 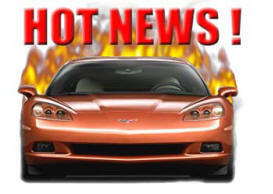 It appears that the C6 will have the highest top speed of ANY Corvette EVER produced! Keep in mind that the 2006 Z06 hasn’t even arrived…hang on, there’s more to come! The C6 promises to be the best Corvette yet, and Mallett’s renowned Hammer conversion will make it just that much better. Exclusive Mallett engine and suspension modifications will make the C6 Hammer a performance-driver’s dream, while Mallett styling features will set it apart from the rest. CLICK HERE FOR DETAILS and SPECS. The second batch of the manufacturing confirmation build (MVB2) of non-saleable C6s starts in uniframe Monday, Feb. 16. A total of nine units will go on line next week, with one expected off the end of assembly Friday. A total of 20 units will be built in this batch during the next few weeks. Some units will be painted the new paint colors for C6 including sunset orange and cobalt red. Luxo blue will also be painted. The all-new 2005 Corvette just edged out the all-new 2005 Mustang as the favorite vehicle of visitors to the Official Web Site of the North American International Auto Show 2004 on MSN Autos. The 2005 Chevrolet Corvette and 2005 Ford Mustang are new production versions of American automotive icons, and unlike many of the concept vehicles that debuted at the Detroit show, they will be available in showrooms later this year. The 2005 Corvette is powered by a new LS2 6.0-liter small-block V8 that produces an estimated 400 horsepower and 400 lb-ft of torque. In terms of overall dimensions, the C6 is more compact than its predecessor, measuring 5 inches shorter and about one inch narrower than the current Corvette. The wheels increase to 18 inches in diameter at the front and 19 inches at the rear. Nine vehicles were nominated by the editors of MSN Autos as significant vehicles of the show, representing a cross section of production and concept vehicles. Visitors to the MSN Autos NAIAS Web site then voted for their favorite show vehicle. Photos of each vehicle were displayed online and the photos were randomly served into a special grid to ensure fairness and to prevent any particular vehicle from consistently appearing in a favorable position. Blocking technology was used to ensure that no individual could vote more than once. Each time a car is built, the plant is documenting problems found with parts, build processes, engineering and tools. This is our time to get these problems solved before we go into saleable vehicle. GM AT THE NORTH AMERICAN INTERNATIONAL AUTO SHOW. (Courtesy or the "Performance Gazette") The North American International Auto Show in Detroit has garnered a great deal of media attention over the past week. This news coverage can potentially change the way consumers think about GM and impact their eventual purchase decisions. Journalists’ and analysts’ opinions, such as “They’re certainly doing a lot of the right things” (George Peterson, president of the Auto Pacific, in the San Jose Mercury News, referring to Pontiac) and “We’re very impressed with the new model” (David Champion, Consumer Reports, in Time Magazine, talking about the Chevrolet Malibu) carry considerable weight with consumers, who often look for objective, third-party endorsements when making a major purchase like a vehicle. We have received word that the official unveiling of the new C6 Corvette at the North American International Auto Show in Detroit on January 4, 2004, will be web cast! Go to www.chevy.com/corvette and look for the icon under Corvette News. It will also be broadcast via satellite (coordinates: Galaxy 11, Transponder 12 K, Uplink: 14242 Horizontal, Downlink: 11942 Vertical, 36.000 MHz, Analog, Ku band). The show is planned to start at 7:00 EST so tune in and be part of the excitement! For those of you on the West Coast, the 2005 C6 will also be on display at the Greater Los Angeles Auto Show beginning January 5, 2004.